Maybe you think of bygone flavors like clove or inexplicable candies like Circus Peanuts. Or maybe you think of retro classics like candy cigarettes and buttons or wax lips and bottles. This list is not about those candies. It is about confections and sweet treats that have been around for hundreds or even thousands of years. As these items are so old, their origin stories are varied or murky. Their ages also mean that these treats have assumed many names and forms in different cultures over time. One thing that remains constant, however, is human beings’ never-ending love affair with sweets. 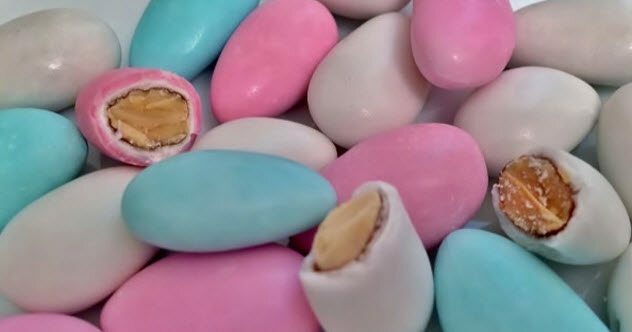 For many people, Jordan almonds are synonymous with weddings, where they have historically been given as favors everywhere from the US to Italy to the Middle East. The combination of bitter almond and sweet sugar is said to symbolize the bittersweet nature of both marriage and life itself. Honey-coated almonds and seeds have been enjoyed by people as long ago as 177 BC in ancient Rome. In medieval times, when sugar became more readily available in Europe, confectioners began using it instead of honey to coat almonds. 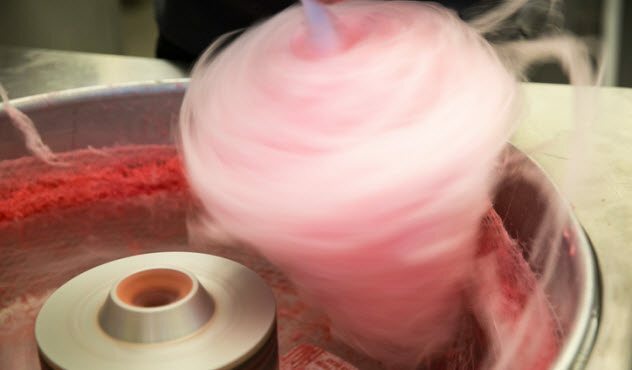 The process for making Jordan almonds and similar sweets is called sugar panning. The almonds are tumbled in a pan while a sugar syrup is added. While the nuts tumble about, they become completely and evenly coated in the syrup, which crystallizes and hardens into a thin shell. This method is thought to have been developed in northeastern France in the early 13th century. It is essentially the same way that modern treats such as M&M’S are made. 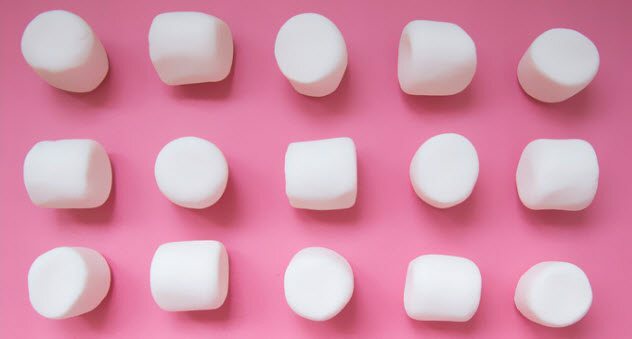 According to some sources, marshmallows date back to 2000 BC in ancient Egypt. However, the ancient Egyptian version bore little to no resemblance to the marshmallows we know today. Then, marshmallow was made from a type of mallow plant which grows in marshes. Egyptians would mix the sap (technically, a sap-like substance called mucilage) with nuts and honey to make a treat reserved for royalty. The mallow root continued to be used through the 1800s to make delicious sweets. It was also used medicinally, particularly to soothe coughing and sore throats, due to its anti-inflammatory effect on mucous membranes. Gelatin (not sap from the mallow plant) is used to stabilize marshmallows today, though the name remains the same. As for the history of the s’more, one of the most popular uses for the marshmallow, it supposedly originated in the 1920s. A “recipe” for s’mores appeared in the 1927 Girl Scout Handbook. Today, marshmallows are most popular in the United States, perhaps due (at least in part) to their use in common treats such as s’mores and Rice Krispies treats. Similar to marshmallow, licorice comes from a root and has a long history of being used as medicine because of its anti-inflammatory effects. The first mention of licorice can be found over 2,600 years ago on some stone tablets from Baghdad, where the Assyrians used licorice to treat sore feet. Throughout history, licorice root has been used for its medicinal properties everywhere from China to the Netherlands to Egypt, where it was found in the tomb of King Tutankhamen. The word “licorice” comes from the Greek word glycyrrhiza (“sweet root”). Licorice root contains a naturally sweet compound called glycyrrhizin, which is 50 times sweeter than table sugar. Nevertheless, some find its flavor off-putting, even when mixed with more sugar. The practice of making licorice root into candy is said to have originated in 17th-century Holland, where it was made into candy ropes. 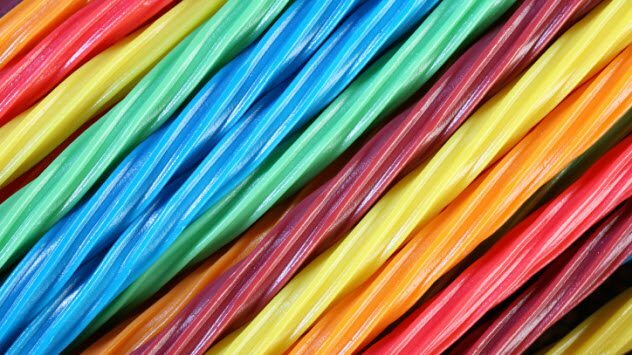 To this day, more than one-fifth of all candy sold in the Netherlands is some kind of licorice. 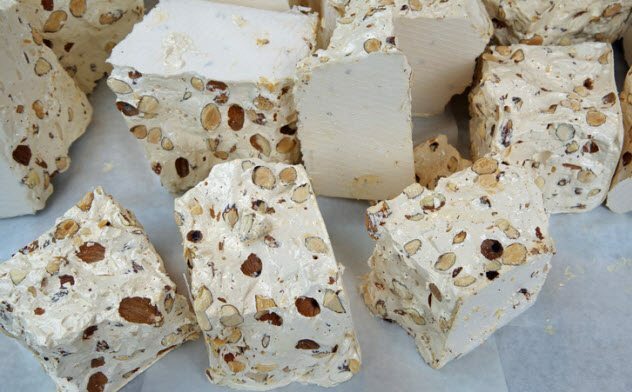 The Italian treat torrone, either a light-colored nougat or a caramel-colored brittle, both studded with nuts, is thought to have been around since medieval times. It’s easy to see how such a confection could date back so far due to its simple ingredients. Traditionally, for the nougat version, egg whites and honey are whipped over a warm water bath for upward of seven hours before being flattened onto a work surface and cut into a log shape. The hard and brittle-like torrone is made simply with sugar, water, and nuts. Almonds are often the featured nut but far from the only one. The treat may also be enhanced by other flavors such as vanilla or citrus. Some historians believe that torrone came about thanks to the Spanish turron, which was then introduced by Arabic immigrants to Spain. Others believe that it originated in ancient Greece or Rome. Its exact origins may be unknown, but as for present-day Italy and Spain, it’s nothing short of a Christmastime staple. Lokum is the name for the treat dubbed “Turkish delight” by the British. Though not quite as old as some of the other items on this list, lokum has been around for almost 300 years. Lokum is made with sugar that is set into a gel by starch. Then it is cut into cubes or lumps and dusted with more starch, powdered sugar, or desiccated coconut. It may also contain nuts. Lokum is traditionally flavored with rosewater or orange blossom water, but it can be found in many other flavors such as lemon and mint. It is often eaten alongside Turkish coffee. Lokum’s culinary “ancestor” is a sweet called kesme, which is made with boiled, thickened grape juice that is then cut into lumps. 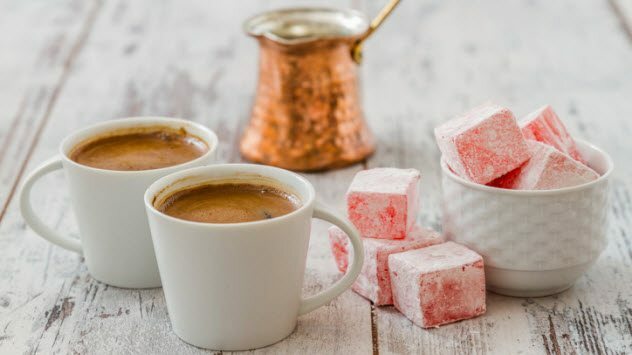 Though kesme is not as well-known now as Turkish delight, it is still made in many places in Turkey today, such as Diyarbakir, Kahramanmaras, and Kayseri. Take a quarter of a pound of treble-refined sugar in one lump, and set it before a moderate fire on the middle of a silver salver or pewter plate. [ . . . ] Set it a little aslant, and when it begins to run like clear water to the edge of the plate or salver, have ready a tin cover or china bowl set on a still, with the mouth downward close to your sugar that it may not cool by carrying too far. Then take a clean knife and take up as much of the syrup as the point will hold, and a fine thread will come from the point, which you must draw as quickly as possible backward and forward and also around the mold [and repeating this process] till your sugar is done or your web is thick enough. It makes sense that ancient peoples would make fruit into leather as it was both a method of preservation and a tasty preparation. 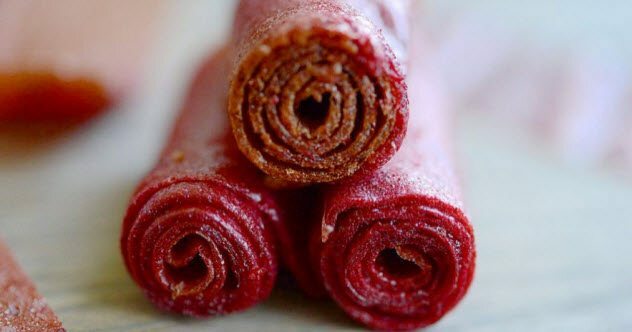 Furthermore, fruit leather could be made from leftover ripe fruits that would otherwise go bad. The basic preparation involves boiling down fruit and then spreading it into thin sheets to dry. Stone fruits—such as cherries, plums, apricots, and peaches—are often used, but they are far from the only choices. Lavashak is probably not even best described as a “sweet” as often no sugar is added at all, highlighting the natural and often sour or tart flavors of the fruits used. Drying the leather in the sun is traditional. But in modern times, an oven may be used to speed along the process. There are many cultures which vie to take credit for this classic treat, as is often the case with anything well-known. Halvah has been dated by some historians to 3000 BC, while others say it more likely originated around the 12th century. Either way, this Middle Eastern confection has a long history. As halvah spread throughout the world, it took on different names and variations. Most commonly, it is a crumbly block of crushed and sweetened sesame seeds. Halvah may have nuts added or be dipped or marbled with chocolate. It can come in various flavors. Some versions don’t even use sesame. This ancient candy was first popularized in the US in the 20th century thanks to a Jewish entrepreneur from the Ukraine named Nathan Radutzky. He founded a company called Joyva, now the leading manufacturer of halvah in the US. 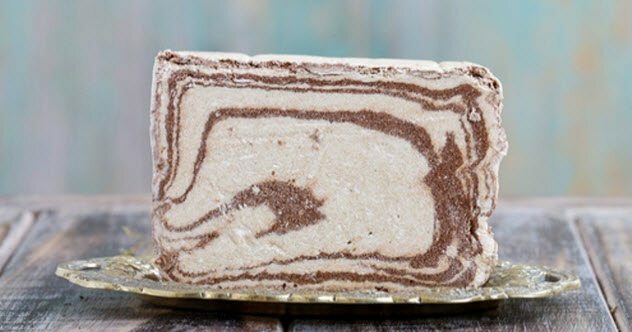 Halvah can be found in Jewish, Persian, and Greek markets in addition to well-stocked supermarkets. Just like halvah, marzipan is claimed by several groups as their own invention. Perhaps the truth is that many different places on Earth, unknown to each other, stumbled upon this appealing mixture of ground almonds and sugar. 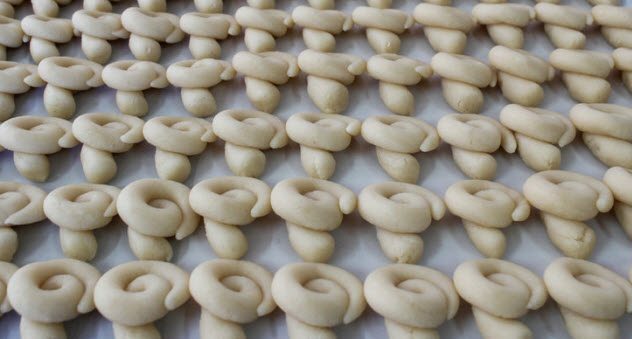 One origin story tells of Spanish nuns trapped in a convent in 1212, mixing their only ingredients—almond flour, sugar, and water—to subsist on during wartime. Marzipan is still eaten in Spain. It is customarily enjoyed at Christmastime and molded into traditional shapes such as that of an eel. Marzipan enjoys popularity around the world to this day. It can be used as a filling for a number of sweets or may be molded into shapes and painted realistically to resemble miniature fruits, vegetables, and animals. When it comes to candy that can be shaped and sculpted, marzipan has nothing on amezaiku. Amezaiku is actually the name of a candy sculpting art form dating back to eighth-century Japan, inspired by Chinese techniques. A taffy-like substance called mizuame (“water candy”) is mounted on a stick and heated so that it becomes pliable. Amezaiku artists then use various tools to shape the candy, usually into animals. Traditionally, artists sit on low stools and sculpt their creations in front of onlookers during festivals. But amezaiku is becoming rarer in Japan. Just a few passionate and talented artists, such as Takahiro Yoshihara and Shinri Tezuka, work to keep the art form alive. 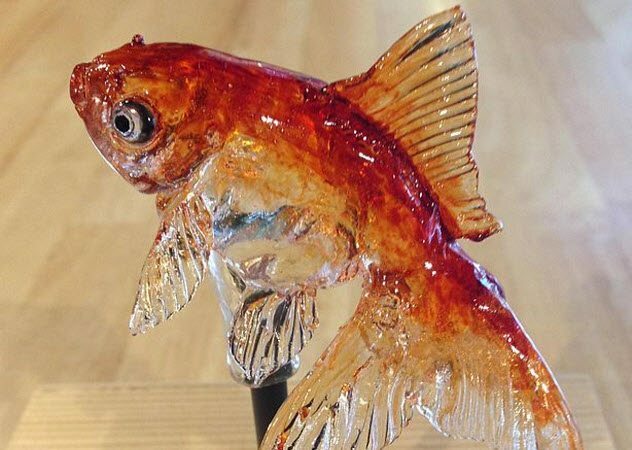 The resulting creations may be too beautiful to eat, but watching these artists at work is certainly a feast for the eyes. Hannah lives in Seattle with her husband and dog. She enjoys writing and researching in her spare time. For some strange stories about sweets and treats, check out 10 Strange Stories And Origins Of Our Favorite Candies and 10 Horrifyingly Deadly Sweets And Treats.